I am slowly making some accomplishments around these parts. A few nights ago, I brought out the ice cream maker. 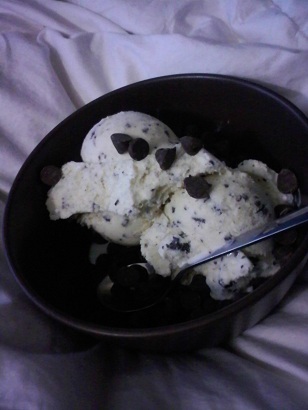 I know I ought to branch out with some crazy cool flavors but chocolate chip is my favorite! You’re supposed to want to have you favorite around, right? I ended up using organic dark chocolate by Wild Harvest (aka Albertson’s organic food line). I do wish I had bought a second bar, because if I’m going to make chocolate chip ice cream, I better go ahead and make it the way I like it (extra extra chocolate chippy). As you can tell, I had to add an extra splash of Ghirardelli semi-sweet chocolate chips as….garnish? Told you I like extra extra. I also managed to buy flour, brown sugar, and the majority of my baking essentials. I’m hoping that what they say is true: “If you stock it, you will bake it.” I don’t know who says that; I just made it up. Further excitement fueled by the sugar rush I just gave you, is that my co-worker and I took it upon our quarter-life crisis to get our motorcycle licenses. Our course began last night a five and a half hour class, which luckily I really liked our instructor other wise it could have been much more painful. A large gentleman behind us with already heavy breathing, decided to nod off on occasion causing noise-cancelling snoring. I was about to go on to describe other interesting characters but I feel as though you might think I’m just pulling from stereotypes, but believe me…these were some interesting folks in this class. Since we both had to ditch work to be early (any late comers got ousted out of the class), meant that we skipped dinner and I certainly wasn’t going to eat when I got home at midnight as much as a scoop of ice cream would have been terrific. 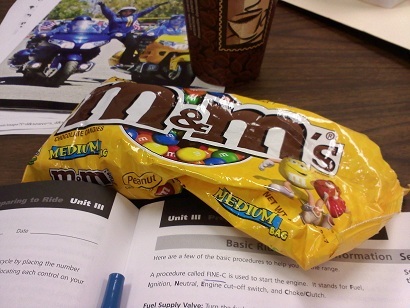 Luckily, my co-worker came through with a big bag of trail mix and an equally large back of Peanut M&M’s that her mother left in her car!